Changning (a prime area) is a popular choice for families and professionals. It is lively, convenient, full of family-safe entertainment, and extremely accessible to the Central Business District. With the elegant French Concession at one end, and fresh modern neighbourhoods at the other, Changning district is an easy area to live in. Its neighbourhoods are alive with delicious eateries, colourful street markets, and it has good public transport to boot. Shanghai's famous garden houses are found mostly in this area. These beautiful houses were built for affluent Chinese during the time of western social invasion. While there are many designs of garden houses, they typically fall under four distinct heads, all western in influence, though built from local materials. The classic garden homes were modelled after the Renaissance, where there was no shame in grandeur or decadence. The villa-like garden houses were made to look like English country homes: sprawling and manicured, with steep roofs and wooden trellises. Many popular historic garden houses were styled after romantic Spanish homes, with airy walkways, lofty balconies and gentle roofs. Recently, garden homes have been taking on a modern look to suit the times. These more recent garden houses are as extravagant and meticulously made as their older counterparts, but more functional and unrestricted in structure. The larger of these homes are found along the Hongqiao, Huaiyin and Hami Lu roads, fully-equipped with luxuries such as tennis courts, swimming pools and dance halls. Changning's district offices have made development a priority, successfully spearheading projects to improve Changning, by offering every comfort and convenience. Xinhua is part of the French Concession. This tree-lined area contains wonderful historical edifices and is home to a wide mix of cultures and cuisines. 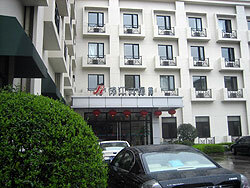 Hongqiao is home to the luxurious Gubei residential area. Designed by French architects, Gubei consists of the most affluent and elegant homes in the area. Built in the early 90's, Hongqiao is now a haven for foreigners settling in Shanghai. It is convenient, has commercial centres, multi-national corporations, international schools, well-stocked grocery stores and even a domestic airport. Chengjiaqiao is a quiet suburb, perfect for those who want to be away from the noise of the busy city, but close enough to jump right in.